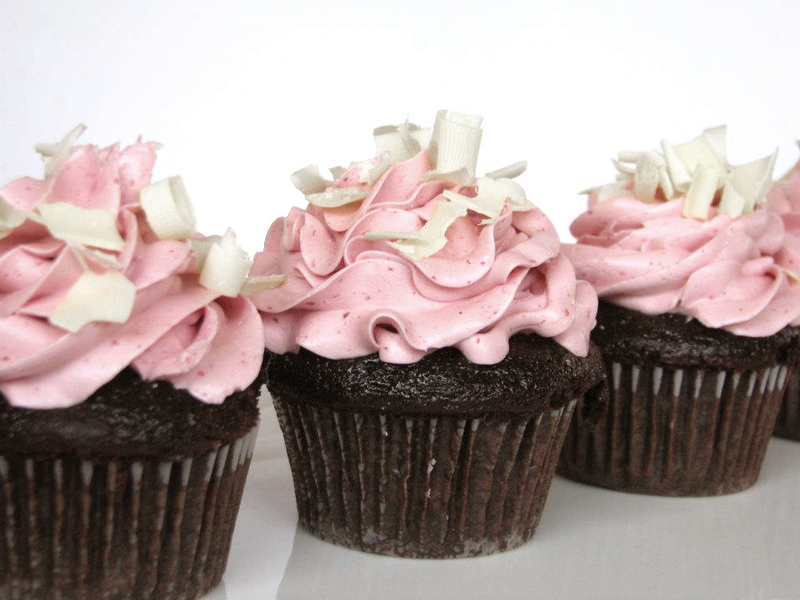 Let’s celebrate my new journey with these decadent chocolate cupcakes topped with a silky raspberry buttercream! After several years of creating and tasting with family and friends, I have decided to explore new adventures in the fascinating world of blogging. With my past experiences, and what I create on almost a daily basis, writing stories and taking photos about my Kitchen Moments seems to be the most natural fit. Let’s talk cupcakes! I am always on a quest to finding that “perfect” texture in a cupcake/cake. I can say without doubt this recipe is all that and more. After reading the recipe my first thought was, there seems to be more liquid compared to dry ingredients but I liked that it called for the melted chocolate, coffee, cocoa powder, oil, and buttermilk. In my baking world this is the combo you look for to create a moist flavorful cake. The original recipe also called for a raspberry filling. At that time, I didn’t feel like doing the extra step so opted for incorporating raspberry into the buttercream. The smooth, buttery, slightly sweet raspberry buttercream creates a heavenly taste and pairs perfectly with this chocolate cupcake. The batter for the cupcakes will be slightly thinner than most recipes but, trust me, it will bake up into one of the best chocolate cupcakes you have ever eaten! Or until you find the next best. For an extra flare I shaved white chocolate (optional) on top of buttercream. Preheat the oven to 350’F. Line cupcake pans with paper liners (you can lightly spray with cooking spray). Place the chocolate chips in a medium bowl; add the hot coffee and let stand a minute or two, then whisk until the chocolate is melted and the mixture is smooth. In the bowl of an electric mixer beat the eggs on medium-high speed until slightly thickened and pale yellow. Slowly add the oil, buttermilk, vanilla, and melted chocolate mixture to the eggs, mixing until well blended. Add the dry ingredients and beat on medium-low speed just until incorporated. Divide the batter evenly between the prepared cupcake liners, filling each about ¾ of the way full. Bake 18-20 minutes or until a toothpick inserted in the center comes out clean. Allow cooling in the pan 5-10 minutes, and then transferring to a wire rack to cool completely. These look amazing! I love, love raspberry too. I’m looking forward to trying these.